Dr Chris Millard recently completed his PhD at the QMUL Centre for the History of the Emotions, on self-poisoning, self-damage and the “cry for help”. He was one of the brains behind the recent ‘Carnival of Lost Emotions’ first presented at the Barts Pathology Museum as part of Brain Awareness Week 2013, which will be part of the ‘Wonder’ street fair at the Barbican next month. More details about the event (including a short film) will be posted on this blog in due course. 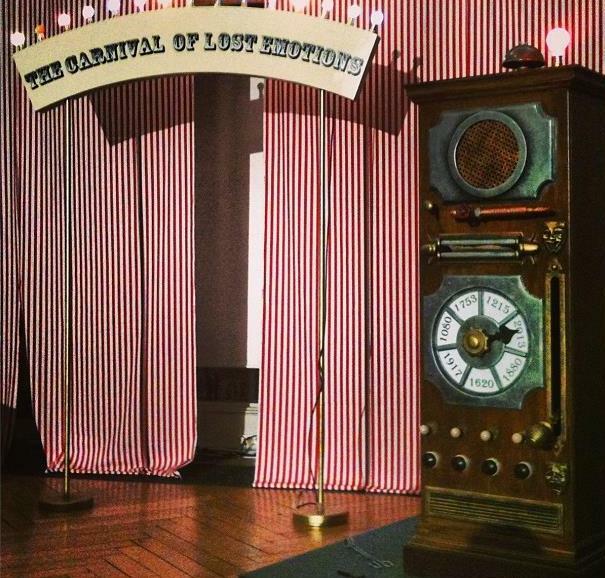 In this post (which was delivered as a closing reflection at the end of the event at the Pathology Museum) Chris reflects on the thinking behind the carnival. 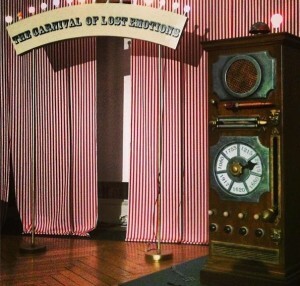 His fellow performers on the night – acting out ‘lost’ emotional states from the past with the help of the amazing lost emotions machine – were Rebecca O’Neal, Tom Quick, Sarah Chaney, Jen Wallis, and Claire Trenery. Just to be clear, I am now talking to you as Chris the historian, rather than a Victorian physician or an army psychiatrist! I’m going to talk to you briefly about the Carnival, and try to explain what we are doing here. 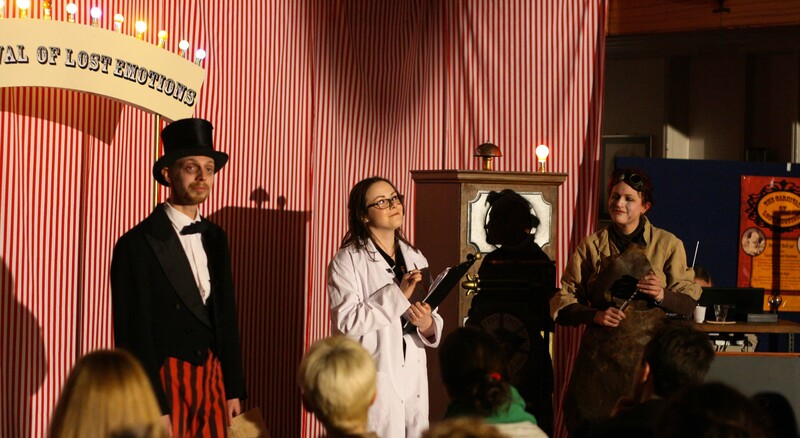 But first, thank you all for coming to the Carnival of Lost Emotions, helping us mark – in our own special way – Brain Awareness Week 2013. I also want to thank the Wellcome Trust for funding this and giving feedback, especially Chloe Sheppard. Thanks also for all the help we have received to put this event on, including Charlotte Thorley, Bryony Frost and Emma Sutton at QM, Becci Feltham at the National Co-ordinating Centre for Public Engagement, and Russell Beck Studio for making our fantastic machine. Thanks also to Åsa Jansson for much help with the script. I would especially like to thank Carla Connolley, whom many of you will know, for being so efficient, facilitating, and friendly, making the whole process of staging the event so, so much easier. This is a short reflection on the logic behind the event, which also will try to provide an insight into why six academic historians might dress up, and act out, emotional states from history. 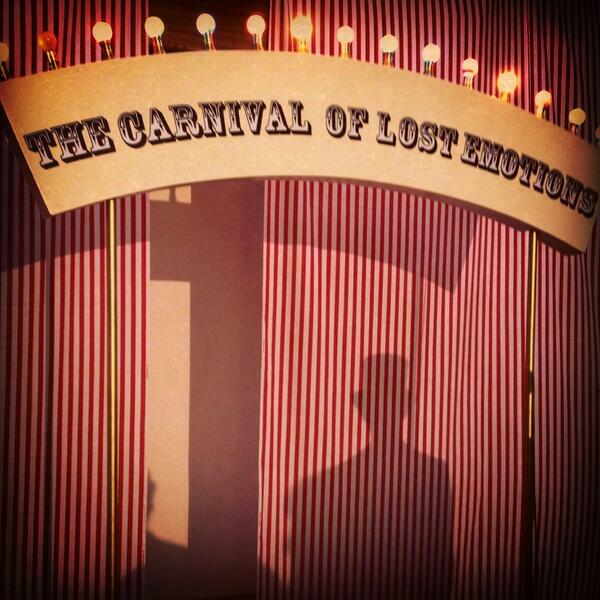 So, with the Carnival of Lost Emotions we have attempted to show that the emotions humans are able to experience have been different at different points in history. It is easy to think that emotional states are universal and unchanging across time and cultures. However, we are suggesting that the historical differences are not merely a case of the same, true and unchanging emotions being interpreted differently at different times. To argue that ‘shell shock’ is simply post-traumatic stress disorder, or that ‘melancholy’ is simply depression suggests a sort of blindness to the richness and complexity and difference of the past. To understand reports of past emotions as simply a less correct, or less precise, versions of present emotional categories, is to collapse the past into the present. In other words, it flattens the past to suit whatever theory currently holds sway. In fact, even to call some of these examples ‘emotions’ before 1800 is problematic. However, for the sake of coherence – and through use of artistic license – we have labelled these states of mind, body, soul or spirit as ‘emotions’. Neuroscientists (for example) might tell you different – arguing for their current understandings. However, as we have tried to show, neuroscientific ways of understanding what humans feel, are part of the stream of history too. Neuroscientific explanations are just as historical as anything else you have seen on this stage. And this is the funny thing about emotions. The ways in which we understand them, how we report them, the terms we have for expressing them, these change the emotions themselves and how they are experienced. Telling somebody that what they feel is a ‘chemical imbalance’ in their brains, can make them feel very different from telling them that they lack ‘moral fibre’ or have an ‘excess of phlegm’. 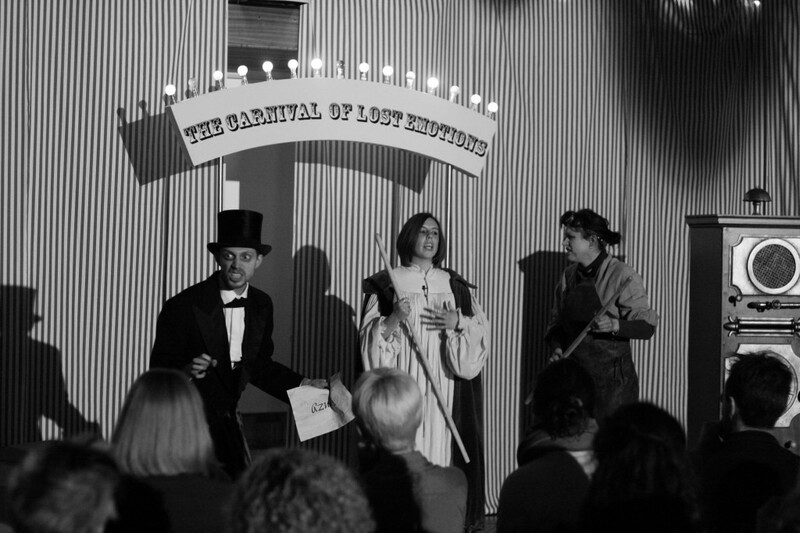 What the Carnival has tried to do, then, is to show how the act of taking emotions from another time period, and assuming them to be close approximations to the ones that we are familiar with is fraught with problems. The history of the emotions can show how the ways that we experience ourselves, the things that we consider most personal, or private, have a history. The feelings that we might think are universal human responses, might look just as nonsensical and alien to those who come after us, as ‘black bile’ and ‘humours’ look today. The point, then, is not so much in the details of the individual emotional states (interesting as they are), but much more in the general idea that the emotional repertoire of human beings at any given point in time is fundamentally historical and changeable. We have tried to communicate this ‘big idea’ through the intensely laborious process of a short play. As Tom, the Ringmaster, commented during rehearsals – ‘this is why nobody puts on a play for one night only’. As you have probably guessed, none of us are trained actors, and a Lost Emotions Machine is not something you can just order off the internet. But what we are trying to do is to start breaking the mould on the way academia engages with wider society . This ‘reflection’ is offered as a bridge between the ‘academic seminar’ way of doing things, and the dramatic performance. We are aware that this format is not everybody’s cup of tea, and we are not trying to replace formal academic seminars. But we have tried something a bit different. 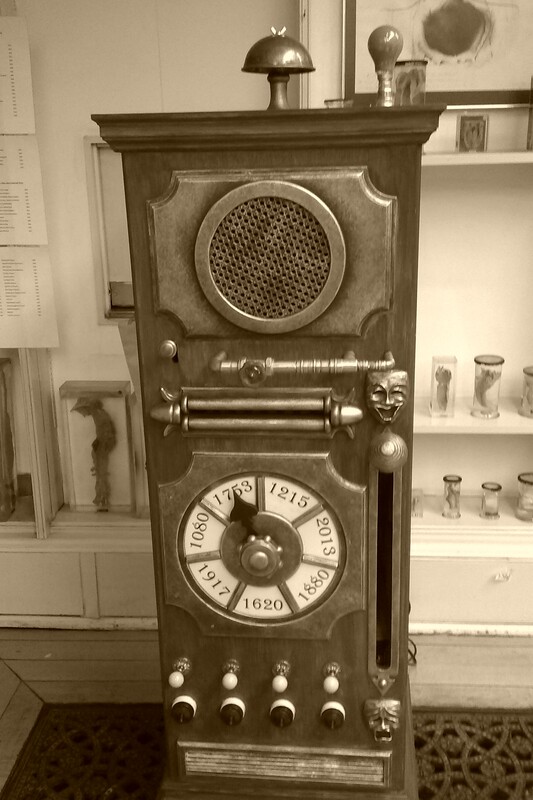 It is a bit of a risk, but we hope that it has encouraged you to take an interest in the Centre for the History of the Emotions, and historical approaches to emotions more generally. We hope it has worked, that is, provoked, intrigued, entertained or enraged some of you. To open oneself up to the idea that the intense private, personal feelings that you experience as so raw and unmediated, are much more complicated and much more historical than they might seem, can feel foreign and odd, perhaps even shocking at first. I shall be sending a link to a survey about this event to everybody who booked tickets. Please forward it on to anybody who you have come with. Please take 5-10 minutes to do the survey, it will really help us out. One person who completes the survey will win £50 worth of book tokens, if they leave their email address, as prompted in one of the question boxes. 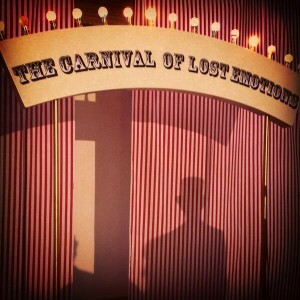 This entry was posted in Queen Mary Events and tagged acedia, carnival of lost emotions, frenzy, lost emotions machine, melancholy, oxytocin, shell shock by Chris Millard. Bookmark the permalink. Sounds very interesting. Totally unrelated, other than in title, I wrote a book full of my feeling of lost emotions, in prose and poetry, aptly titled “Lost Emotions”. 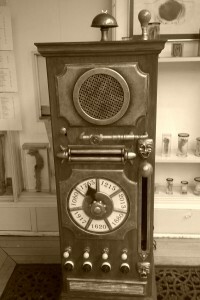 Take a look at it sometime! Reviews and info are on amazon.com (search my name, Greg Bito).